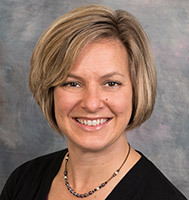 Kari practices speech therapy at the UW Health Rehabilitation Clinic and treats patients with various neurological conditions, including stroke, traumatic and acquired brain injury and progressive diseases such as multiple sclerosis and Parkinson's disease. Her therapy focuses on improving speech output, language comprehension and expression, and the cognitive domains of attention, memory and executive functioning. Kari is a certified SPEAK OUT!® provider for individuals with Parkinson's and related neurologic disorders and offers therapy directed at strengthening the muscles used for speaking and to teach patients how to speak with intent and deliberation. To learn more about this program visit http://parkinsonvoiceproject.org/. Kari is a member of the American Speech and Hearing Association. She holds a master's degree in Communicative Sciences and Disorders from the University of Wisconsin-Madison.